1. Household wastes proceed to the sorting station. 2. The useful fraction of the wastes (plastics, glass, cardboard, metal) is picked out at the sorting line. 3. After sorting the waste proceed to the separating drum where it is divided into large and small fractions. Small fraction contains up to 80% of organic, edible wastes in terms of morphological composition. 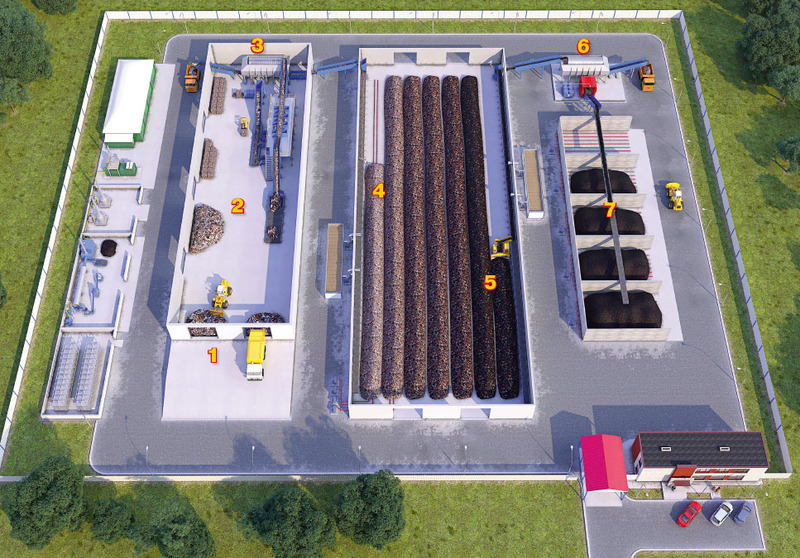 The biogenous part of the household solid waste proceeds to the composting section along the conveyor line. 4. The moldboard moves towards the conveyor line and forms the first compost heap. 5. Komposter agitation vehicle turns the heap and applies thermophilic lactic bacteria. Microorganisms feed on the organic waste, reproduce and produce organic compound and energy. During composting the heap is heated up to + 70ºC and a pathogenic population of bacteria, worm eggs and fly larvae are destroyed. Thus, mesophilic microorganisms naturally die and thermophilic microorganisms preserve their activity which speeds up the process of composting. The composting heap is additionally turned and displaced every three days to nourish the composting mass with oxygen and actively evaporate the excess humidity. Thus, compost is displaced seven times from dirty zone to the clean one and becomes neutralized in 21 days during the process of composting. 6. Komposter agitation vehicle moves the last heap to the conveyor belt and compost proceeds along the conveyor line to the separating drum which separates small plastics, paper and glass. 7. After separation clean compost is additionally decontaminated by ultraviolet and proceeds to the storage hopper. The resulting compost is a homogeneous dark-brown granular mass of “clean” category soil. After state registration compost may be used for city planting, road filling, and sites for solid household waste. We offer services for implementation of technology industrial composting of edible waste to resolve the task of edible household solid waste neutralization and disposal.